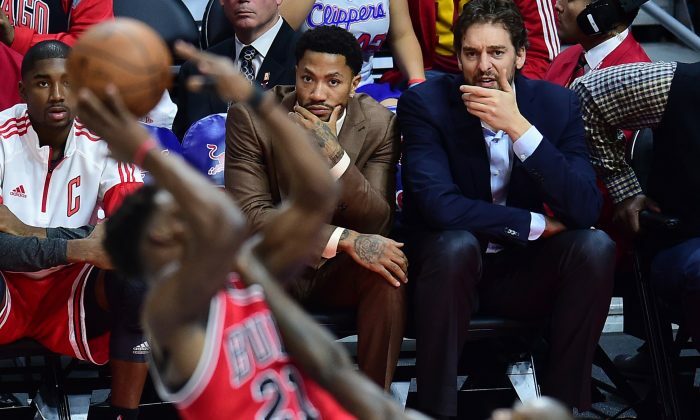 The Chicago Bulls are trying to get back on track after a rough start to their road trip and the news and rumors are ramping up. Derrick Rose could play against the Utah Jazz on Monday. He’s a game-time decision as he recovers from the strained left hamstring he suffered on November 13. “If it feels good enough and it’s not fatiguing when I’m out there during shootaround, I think I’m going to give it a go. But if not, we’ve got a back-to-back, so if not today, tomorrow,” Rose told ESPN. Rose has already missed eight games this season, some due to ankle sprains. He said that the pain in the hamstring is gone but he’s trying to get back into rhythm. Pau Gasol is also a game-time decision, though he said he’s confident he’ll play. Kirk Hinrich is less certain, while Taj Gibson will not play. K.C. Johnson of the Chicago Tribune said that if Rose doesn’t play Monday, the team will consider signing a point guard. With all the injuries, Jimmy Butler is emerging as perhaps the Bulls’ biggest star, and also being reliable in a season filled with doubt. Butler has stepped up and is averaging 20.4 points on .497 shooting, in addition to 6.2 rebounds, 3.5 assists, and 1.1 steals. And Butler still believes the Bulls can still go all the way. “Whatever everybody says on the outside we don’t pay attention to because we’re the ones who have to go out there and win games.It’s us against the world. Some people are on our side, and some people aren’t. That’s how it is,” Butler told USA Today. 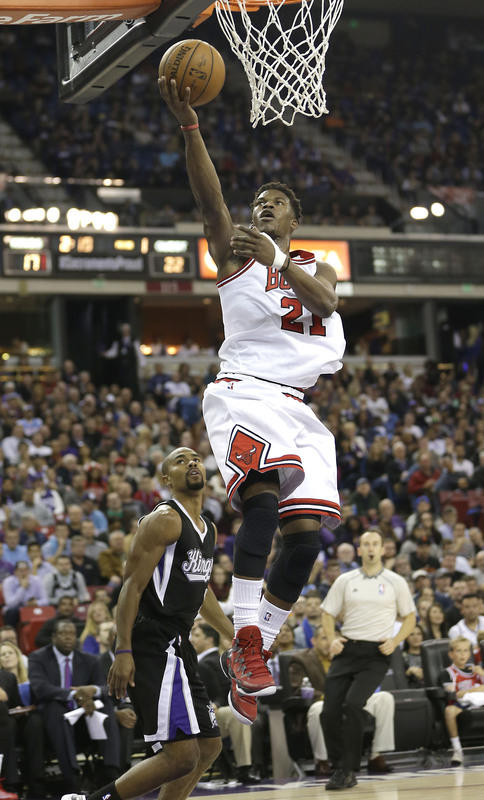 Butler also sought to calm fans who believe he may not return to Chicago since he’ll be a free agent next summer. “I love the city of Chicago. I think everybody knows that. I just feel like I’ve just got to help win games, man. I want a championship,” he said. Bulls reporter Sam Smith noted that rookie Nikola Mirotic is benefiting from the injuries to the Bulls, and has emerged “as one of the few positives” on the road trip. “Mirotic was the lone light on a dark Friday night in Portland for the Bulls with 24 points and 11 rebounds in the Bulls 105-87 loss when Gibson joined the injured group. And in taking up for Gasol and now Gibson, Mirotic has been one of the best on the 1-2 road trip, averaging 14.3 points and 7.7 rebounds on 50 percent shooting in 23 minutes per game in the three contests. He is averaging 5.6 points and 3.8 assists for the season, though in limited play in half the games,” Smith said. “It’s more than impressive NBA potential as an excellent shooter at 6-10, but also with a keen ability to put the ball on the floor and pass off the dribble. Mirotic plays out of control at times and defensively has a bit of the wild crane game with arms flailing and fouls coming in attempts to track down his assignment. “I thought (Mirotic) played with a lot of toughness,” Thibodeau said after Friday’s game. Mirotic, 23, was playing in Europe before this season. The Bulls acquired the big man as part of a draft-night trade in 2011 with the Minnesota Timberwolves. The Bulls gave the Wolves the draft rights to Norris Cole and Malcolm Lee, as well as cash considerations.